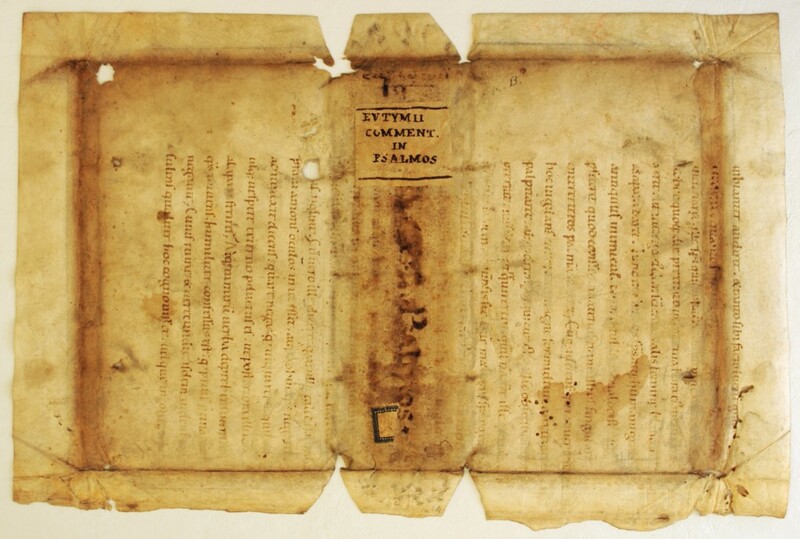 Verso of the Leaf and Interior of the Binding, with the Mitered Flap Unfolded. 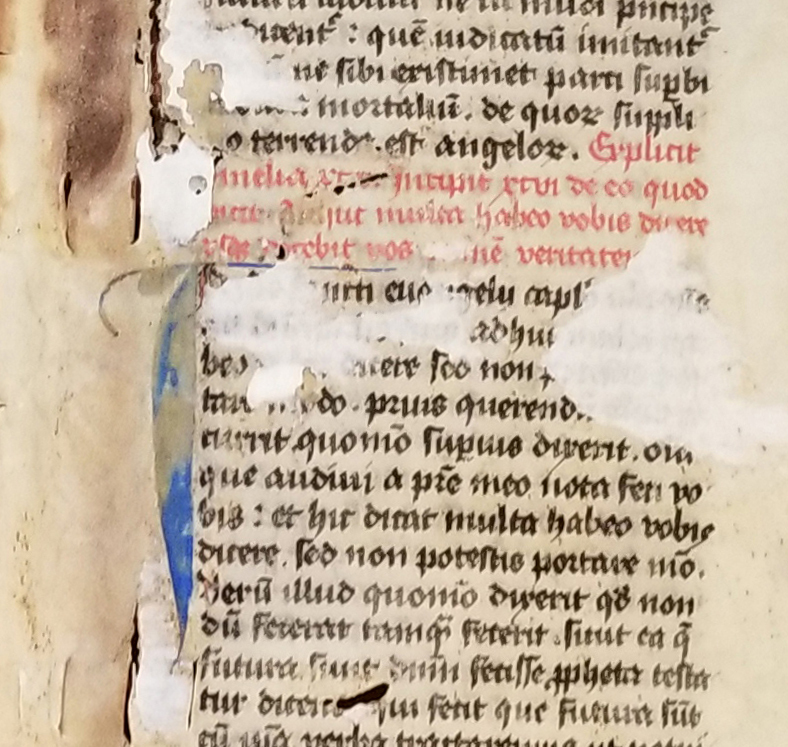 Continuing our series on Manuscript Studies, our Principal Blogger, Mildred Budny (see Her Page) reports the discovery of a reused fragmentary vellum Latin manuscript leaf extracted from a copy of Anselm’s masterwork Cur Deus Homo. 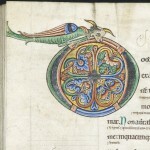 Whether as a text on its own or in the company of other texts, it was made probably in about the third quarter of the 12th century, to judge by the script, perhaps in France. Norman, maybe? 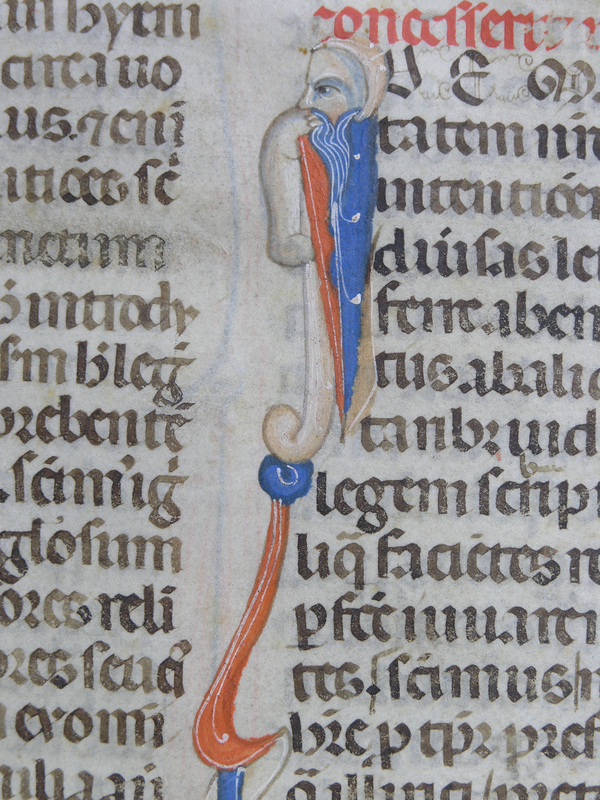 Identifying the text and its sequence makes it possible to recognize which side of the leaf was the original recto, and which the verso. 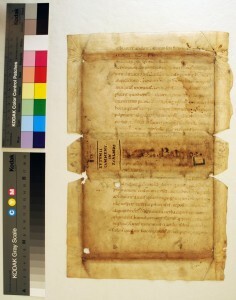 The fragment joins the select known cast of 12th-century manuscript witnesses to this significant philosophical–theological text. Anselm’s texts mostly took the forms of meditations or dialogues. 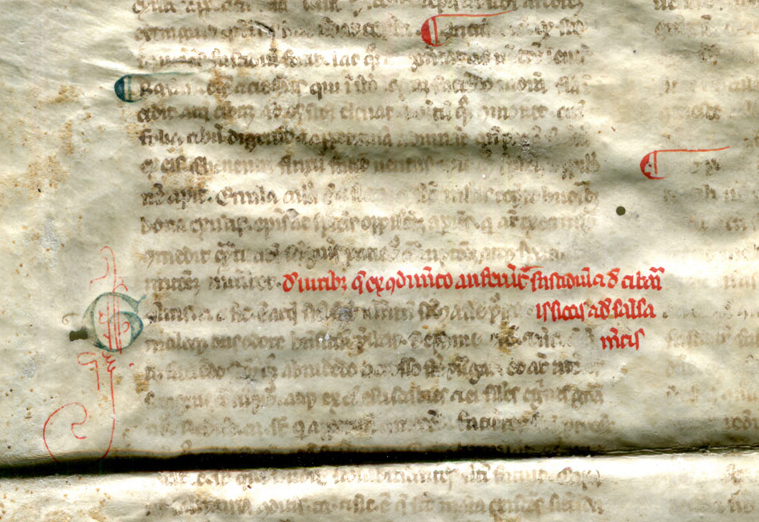 Already our blog has showcased a manuscript with another text by Anselm: A New Leaf from ‘Otto Ege Manuscript 41’, which formerly contained a copy of the Prayers and Meditations. Now we focus upon one of his principal dialogues, cast between master and follower, as they debate the natures of divinity and necessity. In our blog on Manuscript Studies (see its Contents List), Mildred Budny (see Her Page) continues to report the results of research for her Illustrated Handlist. 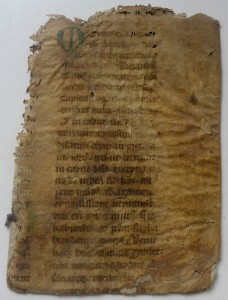 Here, we focus upon a leaf plucked from its 12th-century manuscript and pressed into service, with trimmed edges and mitered folds, as the vellum covering for a binding for a different text of small format. Both texts, primary and secondary in the life of the leaf, concern religious subjects, but they emanate from authors of different dates, locations, and languages in the Latin West and the Orthodox East respectively. 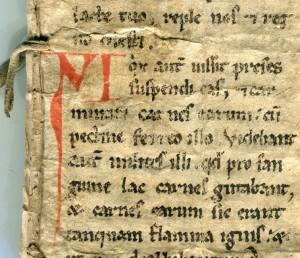 The primary text represents a remnant of a text and an author familiar in some other blogposts, which consider the Dialogues, the Sermons or Homilies, and other texts by Pope Gregory the Great (pope from 590 to 694 CE). in Greek or in Latin translation? For this secondary use, the remnants of a set of titles on the outside of the spine of the cover (the original verso of the reused leaf) remain in place, albeit abraded and fragmented, as both a pasted, inscribed paper label (orientated along the ‘horizontal’ across the spine) and an ink inscription on the reused leaf itself in Capitals (‘vertical’, with the tops of those letters turned toward the ‘front cover’). Another, smaller and fragmentary pasted label with a broad rectangular border stands near the bottom of the broad spine of the cover and partly overlies the ‘vertical’ spine inscription. Acquired, probably by purchase (according to the Owner’s recollections), in France in the past 15 years or so, but before 2007 when I first saw and began to photograph the leaf. 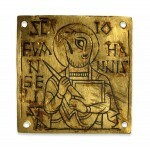 This item and others in the Illustrated Handlist acquired in France at various times and by various means (purchase, gift, or exchange), came from a single source in the Département of Saône-et-Loire, from about 1999 onward. 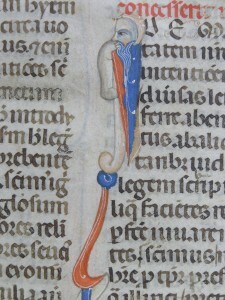 Because the leaf does not carry indications of its original place and time of production, apart from its materials, layout, design, script, orthography, and punctuation, those unknowns must depend upon evaluations of the style of the script, lacking any forms of embellishment, such as decorated initials, which might have provided possibly more closely datable symptoms than the letters “alone”. Yes, we know. Don’t know much about this part-leaf. Why should we bother you? 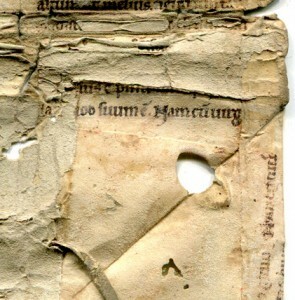 The extracted and reduced leaf was converted through reuse into part of the cover or wrapper for some volume or other, now unknown. At some point, at least by the year 2016, the part-leaf was removed from that interim position and offered for sale on its own online. 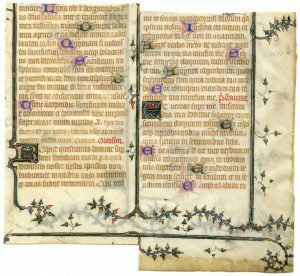 It has come to its present owner recently, without record of the provenance of the leaf, or the nature and contents of its former volume, let alone of its original manuscript. 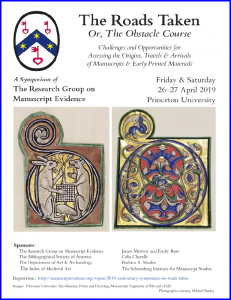 As characteristic for the problems presented by such discarded and commercially transferred medieval manuscript materials, we must resort to examining the evidence of the material itself. Good thing, it may be, that we and other colleagues have some experience with such tasks. 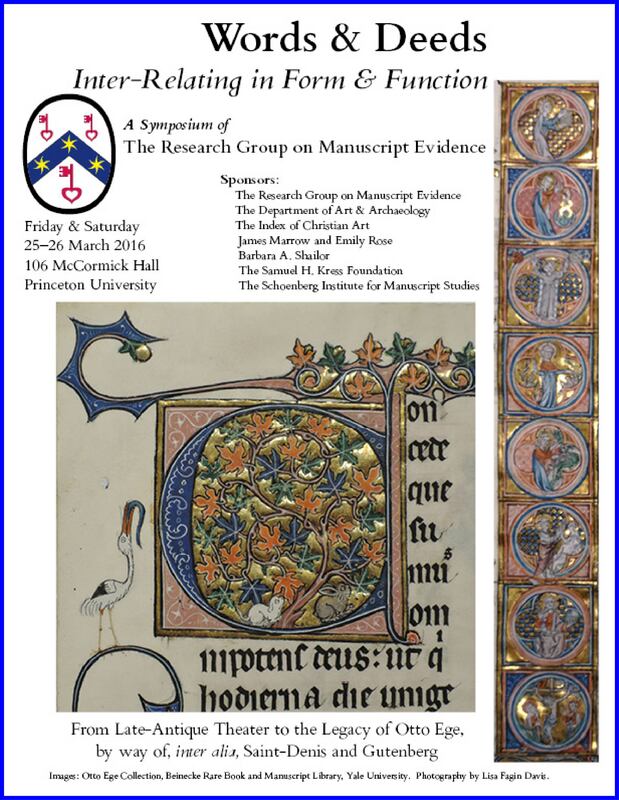 Have a look, for example, at the discoveries reported in our our blog on Manuscript Studies and our colleagues’ contributions to meeting the challenges which dismembered and dispersed fragments pose, as for our 2016 Symposium on Words & Deeds and its downloadable Program Booklet. 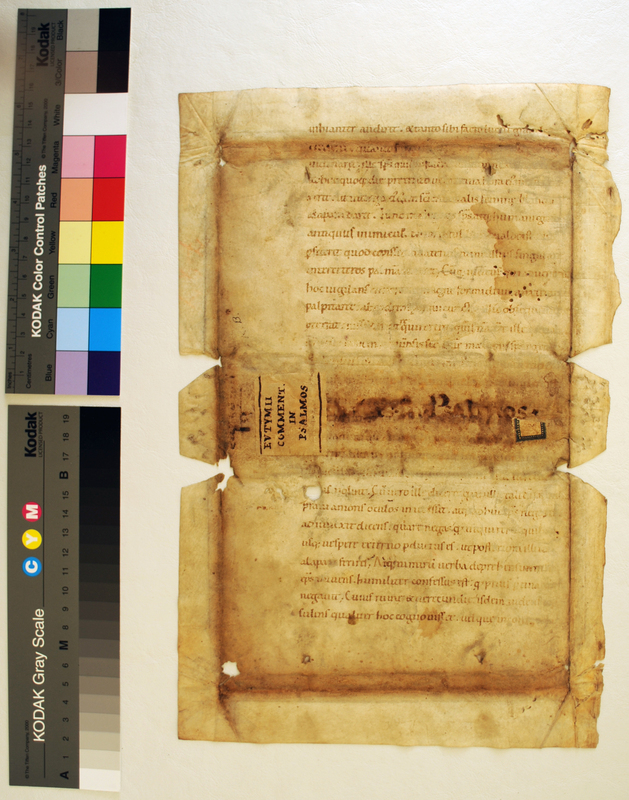 Continuing our series of blogposts on Manuscript Studies, Mildred Budny reports on manuscripts and fragments dispersed in various ways. 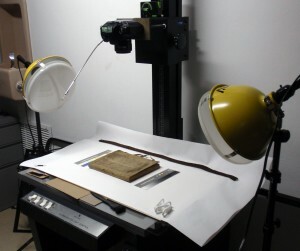 Now we unveil a leaf reused as an wrapper-style enclosure or tied folder, with its own story to tell. 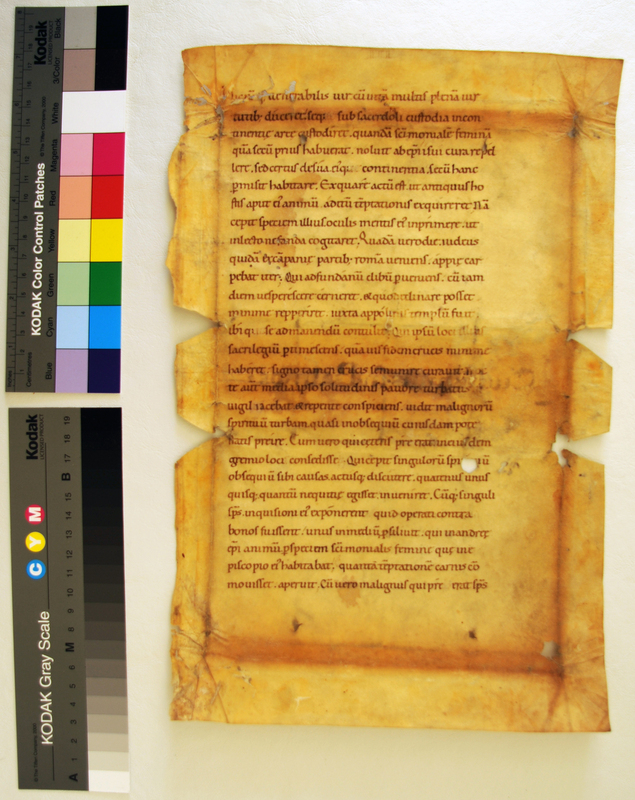 Continuing our blog on Manuscript Studies, we illustrate a fragmentary medieval bifolium, much damaged, from a large-format manuscript retrieved (without recording the contextual information) from its long-term reuse as the vellum cover of an unknown book with a thick back. The reuse, at an unknown stage, presumably took advantage of an out-of-date medicinal textbook. Shame on the retrievers for not recording and letting us know the location from which the bifolium was removed. 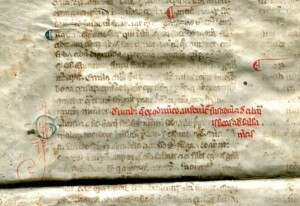 Whereas many reused medieval manuscripts survive from discarded religious texts rendered obsolete by changes in liturgical practices and religious beliefs, for example during the Reformation, the French Revolution, or less catastrophic (r)evolutions, this case represents a relic, or battered fossil, of advances — or anyway transitions — in scientific, medical, pharmaceutical, and related spheres of knowledge in Western Europe. Some of our posts describe the former; now we turn to the latter. Here, we mainly allow the pictures to do the talking. Here continues our blog by Mildred Budny on Manuscript Studies, for which the Contents List offers a guide to the series. 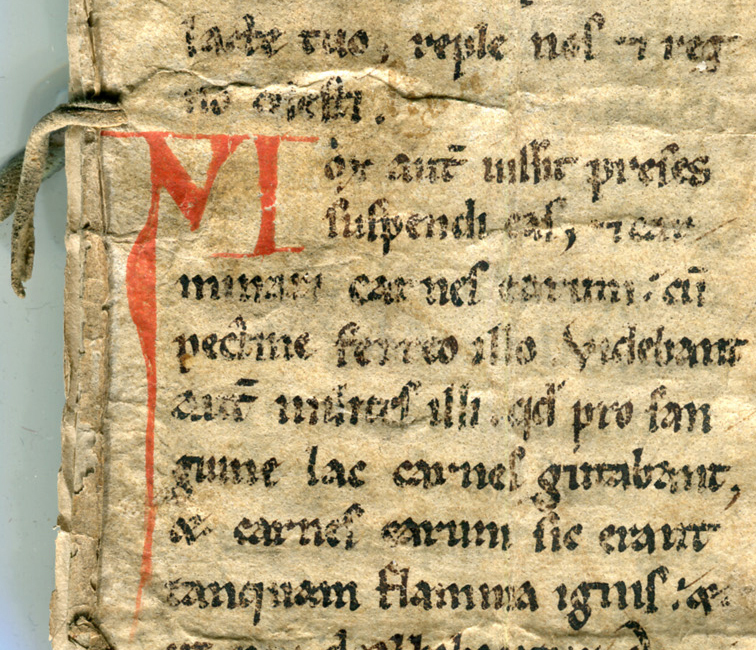 Now we look at a fragment from a 12th-century manuscript containing, or partly containing, one or more saints’ lives intended for reading aloud. 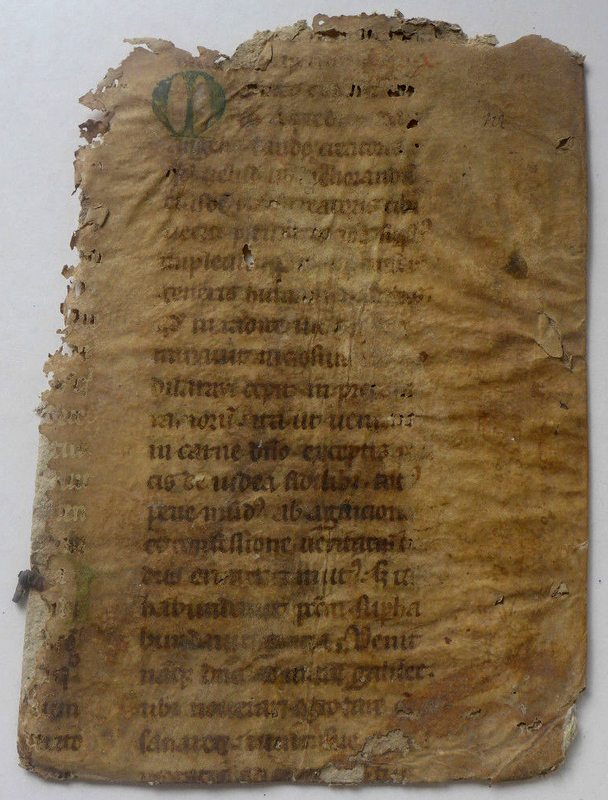 A fragmentary vellum leaf in Latin now in a private collection represents a remnant of the Passio Sancti Blasii Episcopi et Martiris (‘The Suffering of Saint Blaise, Bishop and Martyr’) from a manuscript dismembered for recycled use. 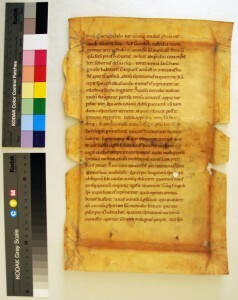 Laid out in double columns, the text is written in upright proto-Gothic script of circa 1170 CE from an as-yet unknown center. 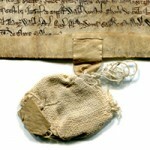 Similarly, the medieval ownership of the leaf remains unknown, although the reuse as a limp vellum cover for an 18th-century paper notebook comprising a register of receipts in French presumably indicates the location of the leaf, if not the rest of its book, at least by the early modern period. Given the fragmentary nature of the surviving evidence, we’ll take all we can get.